San Diego Lodge No. 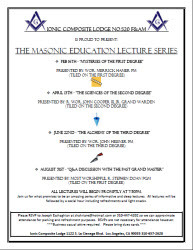 35’s Past Masters and Affiliated Past Masters will be conferring the 3rd Degree of Masonry. 6pm Dinner followed by the Degree.